After talking to Brian Mercer the importer of the amazing Dark Candi Syrup and making multiple attempts to make my own at home, I think I have come up with something that will hopefully be tasty, but doesn't approach the color contribution. I have included this one in my second Belgian Sugar Experiment, so I'll have a more accurate impression of the flavor and fermentability by early November. 1. Take 1 lb of plain white sugar and mix it with 3 cups of water in a heavy bottomed saucepan. 3. Monitor the temperature until it hits 285 degrees then add a tablespoon of water. 4. Adjust the heat until it is hot enough that you get bubbles all over the surface of the syrup, but not so hot that the bubbles build way up the pan. 5. Repeat this as needed not letting the syrup get above 285 (This will be a lot easier if you have a thermometer with an alarm). During this process you will smell an amazing range of aromas starting with butter, then moving through rummy and finally to sort of a roasted raisin thing. 6. Once the syrup takes on a nice dark color add 1/3 cup of water and let cool. Boiling sucrose for awhile in water causes some of the disaccharide sucrose molecules to split (invert) into the monosaccharides glucose and fructose. Some recipes call for the inclusion of an acid to aid the inversion process, but the importer assured me that the only ingredient in his product is refined beet sugar (sucrose). Result: Way too sour, apparently I used way too much acid. Result: The syrup turned out a bit thin and the flavor just seemed flat. Result: Good flavor, but a bit too much char probably from the high temp. Result: Good flavor with less burnt notes than attempt 3, but also not as dark. I used my 4th attempt in my second sugar experiment. I am happy to report that the portion of the experiment with the homemade candi sugar got just as dry as the other portions. The beer tasted good at bottling time, but it will be a few weeks before I can give a real report on the success or failure of this technique. Here is a short little video of attempts two (left) and three (right) boiling. You can see just how much the sugar bubbles can build up. When I tried making candi sugar, I added some lemon juice because citric acid was supposed to help inversion, I think. Since I only did this 1x, I'm not sure that how it really matters. It looks like you gave up on using acid on batches 3 and 4. Why? The main impetus from leaving the acid out was talking to Brain, the importer of Dark Candi Syrup. He told me that what he imports is 100% sugar with no acids or anything else added. I hadn’t had great results with the acid, so I decided to try it without acid and I think it turned out well. You are correct that the acid is normally used to help the inversion process, however sugar will partially invert on its own with just heat and time. Certainly you can make a tasty sugar syrup with the acid, but from what I understand that isn’t how it is done in Belgium. I know Lyle’s Golden Syrup does use acid in the inversion process, but that acid is then neutralized by a base (leaving a salt behind). They’ll be some new tasting opinions on this one in a few weeks when we taste the beer I made from this syrup, and the other beers I did in the 2nd sugar experiment on Basic Brewing Radio. Any final comments on your sugar experiments? I'd love to try making some, as morebeer didn't have any in stock when i made my last free shipping order. do you think you could make the belgian dark candi syrup clone by just holding the pan at 285 for longer? I still have a bottle of each from the second round, so at some point I will revisit them. If you want it darker I think you would have to go hotter, by the end I wasn’t getting much color change. As long as you keep it below 330 you should be able to keep the sucrose intact and preserve most of the fermentability (but I haven’t tried it). Good luck. I am considering doing another round with just clear/white sugars to see if there really is a difference. I tried making this Candi Syrup, and it didn't get nearly as dark as the imported stuff. I wonder if this could be made darker and stronger tasting by crystallizing and removing the sucrose out of it, leaving only the caramelized fructose and glucose? It certainly sounds like that is the way the stuff in Belgium is made. WIthout doing that I would guess that it is impossible to get the same level of character/color. If you like the flavor of the sugar as is and just want more color you could always just add a couple ounces of carafa special to the beer. The answer: BAKE IT! 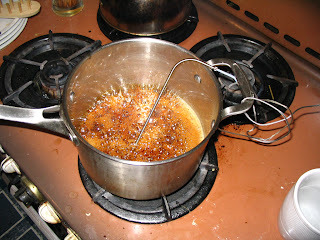 I've found that a fool-proof way to make candi syrup is to use the oven. What I did was bring my syrup to a boil in a OVEN SAFE pan. Once it reached 300 I took it off the heat, added 4 tsp water, covered the pan and put it straight into a 300 F oven until I got the desired color. The advantage is that the temperature is constant and so the sugar won't burn. I think this is the way to go when trying to emulate really dark candi syrup. Great idea! About how long did it take? After 1 hour it seemed to be as dark as store bought. However, after the sugar started to turn color on the stove (about 300F), the residual heat in the pot raised the final sugar temperature to 325 F even though I removed it from the heat. The sugar was then "over-caramelized" and the result was a slight burnt aroma/flavor. I have not yet re-tried the process, but I think a combination of lower temps (no higher than 300F) and checking the progess every 15-20 minutes would produce better results. It is very interesting for me to read that blog. Thank you for it. I like such themes and anything connected to them. I would like to read a bit more on that blog soon. I tried my oven method again by bringing it the sugar/water mixture to the softball stage on the stove, then putting it in a 325 F oven for about 30-45 minutes. When I pulled the sugar out it was the color of dark (real) maple syrup, but it tasted slightly burnt so I didn't go any darker. Instead of dumping it, I put it in a glass jar in the fridge. Now, about 3 weeks later, the flavors have mellowed and the burnt taste is almost completely gone. So maybe the key to getting dark syrup is not to worry about the immediate flavor, but to let the burnt flavor dissipate before using it. Well posting on something two years old but.... Your average home crock pot holds temps around 220-250 on high. I made a syrup by holding jaggery sugar and water for 48hrs. beautiful deep brown with ruby highlights and the taste was burnt sugar with dried cherries and raisins. Sounds delcious! Over on Ryan Brews, Ryan posted some info on a different way to make candi sugar that sounds really promising. Posting well after the party is over, but wanted to thank you for this post. Much cheaper than buying syrup. I made two batches of 2 lbs. one dark, one Amber. Worked beautifully, but both hardened somewhat before I could used them. Any way to stop this from happening? Did you add water after the syrup reached the target color/flavor as suggested in step 6? Michael, I made some last night and this worked great for my Chimay Red clone brew today. Thanks for sharing!